Watch 18 artists from around the world collaborate to make art together in the Midlands. Self-directed education through interactive creative practice, exchange of ideas and skills will mark the two-week-long Thupelo International Workshop currently being held at the beautiful Kings School in Nottingham Road. This workshop includes 18 artists from five different countries giving them the opportunity to work together in various disciplines. This initiative of the Cape Town-based Greatmore Studios runs until April 12, culminating in a public open day on April 13 from 10h00 until 15h00 during which time the work will be on display for public viewing and audience engagement. 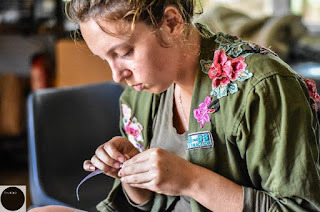 “The idea behind the workshop’s ethos is about creating space for making art without the pressures of structured conventions often accompanying the so-called ‘mainstream’ institutions and is open to self-motivated visual artists who are keen to expand their ideas, exchange knowledge and experiment in fellowship with other artists. This also encourages a space for sharing skills and ideas in an innovative environment where artists feel safe to experiment and learn from one another. Since 1985, each workshop, regional or international, has had its own identity which unfolds as the workshop progresses. 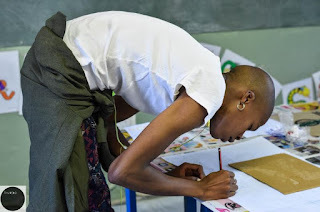 Because the material budget is often quite low, sharing and the use of found objects or donated materials is encouraged,” explains Witty Nyide co-ordinator for both regional and international KZN-based Thupelo workshops. Thupelo, which is Se Sotho phrase meaning ‘to teach by example’, was initiated in 1985 in Johannesburg by David Koloane, together with the late Bill Ainslie and a group of artists. 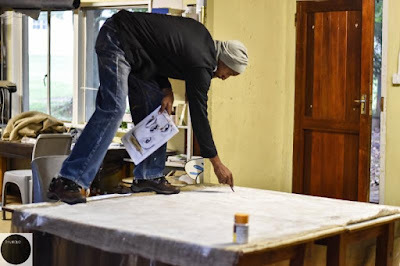 Both regional and international Thupelo workshops were initiated in response to a need for interaction between artists and are therefore artists-led. It is part of the international Triangle network of studio and workshop initiatives. Durban has hosted a regional workshop last December and is hosting an international version this April in the beautiful KZN Midlands. Participants are: Anushka Kempken (Johannesburg); Crawford Mandumbwa (Zambia); Danisile Ncube (Zimbabwe); Khaya Sineyile (Cape Town); Lara Vlaska (Germany); Mat Li (Madagascar); Ncumisa Mcitwa (Durban); Nkcubeko Balani (Grahamstown); Nomusa Mtshali (Durban); Owen Shikabeta (Zambia); Selloane Moeti (Durban); Tahina Rakotoarivony (Madagascar); Vanessa Chen (Cape Town); Thalente Khomo (Durban); Clive Sithole (Durban); Thami Jali (Durban); Anthony Cawood (CT) and Witty Nyide (Pretoria). The workshop culminates with an open day where the public can experience the visual conversations created during the retreat, and this will open to public viewing on April 13, from 10h00 until 15h00. Entry is free and all are welcome. If there is demand for a bus to take people from Durban to Midlands and home again for the morning, one can be organised for a nominal fee. Should anyone be keen to take arranged transport – please contact Witty Nyide on 076 333 3671.